When you are a “Grandma” – learning new computer skills are way pass “Dumb Dora’s,” ability! This is one such day, for me, the “Grandma” – when the learning just does not want to go into the right part of my BRAIN. When, like in my case, have some pictures that someone would like to put in their book – that they are writing – to be published soon – had to get instructions on – “the HOW TO DO” – and my biggest mistake was not making written notes, as I was doing the first couple pictures. “Dumb Dora” – that’s my name for myself when I have a task assignment to do and I feel completely out of my realm as to what to really do – being afraid to make a mistake – I start as I think I remember and as I begin – the sequence seems just a little different and as I cancel and try to start over – I feel like I am so far into the “FORREST” of mentally being lost – there has to be a step to do – that I have forgotten? So, we go over the sending of a picture with the email again! I, sitting there and doing one step after another – just as I am being told and then, the magic word is said! “Hit the symbol for “ATTACH” – “WOW” – I had to say the word “ATTACH” – several times! That’s what I forgot to do. Every time I went to send the email – never gave “ATTACH” a second thought – no wonder no picture was received on the other end? Posted in Family, Grandma, Todaywith no comments yet. Mar 30th Food For Thought – For Tomorrow! Standard old tricks, but new to you and your family if you have never tried these before – switch the SUGAR with the SALT for those in the household that would have their eyes closed, or at least half-closed in the early hours of the day? You can blame the “LITTLE PEOPLE” that come in the night and do these kinds of things to unsuspecting people. That’s just in case some times some “early in the morning people” with their eyes have shut cannot take a joke? Remember “LOVE” – start the evening before with “LOVE” – early in the morning adding more “LOVE” – You and YOURS will end up with lots of – Fun – Happiness – and Joy! ***** and if that does not equal… “LOVE” – – I’ll eat my HAT! 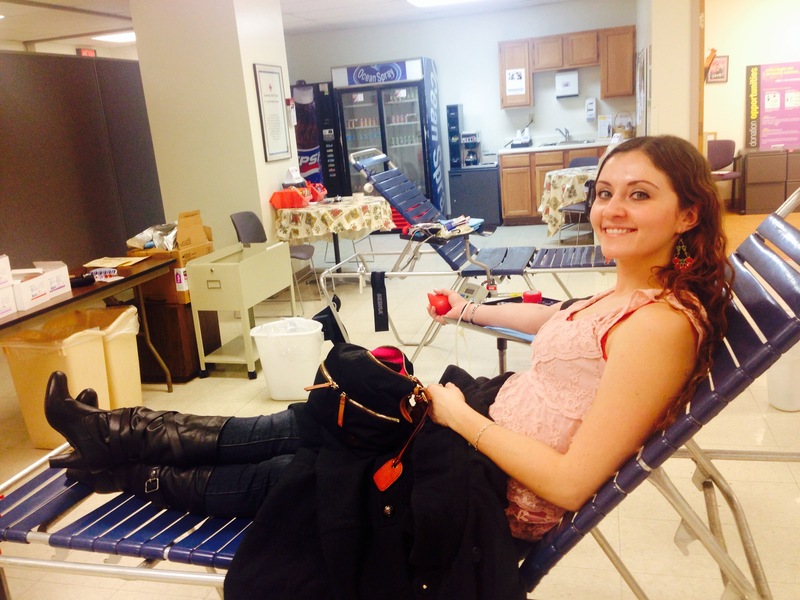 Have a picture of my Grand-daughter, Alyssa Aldrich –she is giving “blood “on her Lunch Hour – and with the big smile – you can see she is enjoying giving the best gift – one’s own blood to save another’s LIFE! March is the Red Cross Month – and I am so proud of Alyssa for caring enough to give her own blood – and without having been, even asked to do so. When Alyssa, e-mailed this photo over to me – it was the best picture to have received – I just had to make a couple of copies – immediately! I used to give blood years ago and even did RED CROSS volunteer work for the grade school that my sons were attending – so you know how long ago that was. There came a time- when my blood decided to change. When they do that test to be sure you have enough iron – my blood would not do the drop and spin test – and then they just could not get my blood to fill up the require amount needed for a successful donation? Looks like I needed to take iron supplements – and still have to take my vitamins. March 1st, 2014 was Peanut Butter Lover’s Day! Without knowing that – last weekend I had made Peanut Butter Cookies – and they were the best. It was only in the last year that I had decided to try “Peanut Butter” – all the years that my sons were having “Peanut Butter” sandwiches when they were in grade school – I just could not even think to eat it. And, to put Grape Jelly on the same sandwich – that was too much for me – but now I just love “Peanut Butter” on one slice of toast and then on another slice of toast, I’ll put some jelly. I cut each slice of toast into four pieces and will eat one little square of peanut butter and then one little square of the jelly toast. It sounds odd – but at least, that’s the best way for me to enjoy the favorite sandwich of everyone! Posted in Family, Todaywith no comments yet. Mar 28th Half Way There! 40 Days from Ash Wednesday till Easter – so we are ‘Half Way there’. Easter will be April 20th, 2014 and when I was a kid – we were taught to reflect on our lives’ thus far – and start making some changes for the Resurrection of Jesus – beginning with a plan – just for me to work on making me that much better a person. I was to want to do all these new things that were suggested by the NUNS – changes that by implementing while still a small child – would become second nature – and in all my LIFE – I would know the right things to follow and do forever. Just because there might be some “HISTORY” in the family – for a vocation into the Religious Life – it is something that you just cannot force. So, now with the LENTEN season, it would really be a good time to pray for everyone – for those who may be preachers and teachers – for those in the world in areas that are in war-zones – that do not allow their citizens to go to Church and for those in areas where they are killing people just because of their FAITH. “PAY-IT- Forward” with our Prayers and our Charities that we can do for those around the World – those who are hurting and their very LIFE is at a total risk – just trying to survive under the dictator type run countries – where lives are consider worthless. Let us remember our fellow-man – our neighbor – with LOVE – during this Lent Season – just as Jesus, directed us do in the New Testament! Posted in Childhood, Family, Todaywith no comments yet. I did pick up some cans of “Salmon” and the first cat just ate the whole can full and left nothing for the second cat – but when I bought more of the dry food – the first cat turns up her nose. I’m guessing someone else in the neighborhood is also feeding the cats – because if she does not like what she sees here – I receive a “DIRTY” look! When I noticed what was happening – I had to hurry out with the new Sunflower Seed! It was like I re-opened Grand Central Station! It feels good to know that the BIRDS and CATS can let me know exactly what they like and that I can provide it for them! When I happened on the Sandra Day O’Connor, 1st woman to the Supreme Court article – just had to think about writing about – Irish women in the month that belongs to celebrating the Irish and the names “DAY” and “O’CONNER” – and little pieces of memory to share! Before the month of March is over – may as well wish that more women of Irish decent partake in the American government, Federal and State offices – to guide the people as only a good woman can! Everybody has heard that behind any man in any strong position there are women doing the nuts and bolts work to make it look like the man is running the show with a smooth hand! Some names just live in your brain – even though there was only a short period of time when you were associated in any way with the person. Where I was working some years back, every new employee had to be tested for drugs – must have been when there were lots of people who had time and money for drugs. So, I went to this doctor’s office, Doctor Day – and since this was such a nice name “DAY” – never met anyone else with that same name – but if you could just choose a name – I always thought “DAY” for a last name would be nice and easy for everyone you met – they would be able to remember – you and your name! “O’Conner” – this is the last name of some children who were in the Orphan Home – with me. The reason I remember the name was because this boy’s first name was “Cain” – and probably a very good Irish name! There was nothing that the boy had done – he was much younger than me and in the “BABY Room” – and as needed – some of the older girls would have to relieve Sister Zitta, from her duties – who had the direct care of the children from two years of age to five years of age – at different times of the day. When I would bring the children from the “BABY ROOM” down to the playground for a walk to the orchard area to play – there would always be some kids calling to Cain O’Conner –“Hey Cain – where’s Able?” I would always have to yell back to whomever – “Cain does not know what you are yelling at him – shut up!” So, for the six months that I worked in the BABY Room – the name Cain O’Conner just got stuck in my brain. I cannot remember any of the other babies’ names? May the “GOOD LUCK” of the IRISH be with us – one and all!